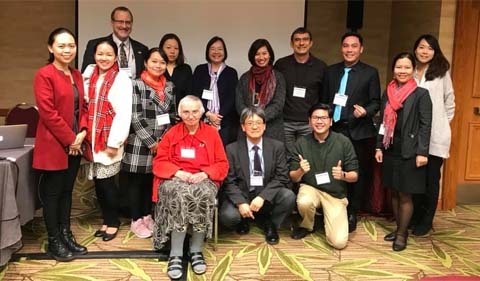 Dr. Chris Thompson (back left) and Dr. Hiro Kawamura (center), members of the AAS Panel and other members of the Japan Foundation Sponsored Professional Development Project. Dr. Christopher Thompson, Associate Professor of Linguistics, served as discussant for an ethnographic research panel on “Sustainable Community Development In Asia Through Tourism In Southeast Asia: Potentials and Challenges” at the Annual Conference of the Association for Asian Studies in Denver in March. Thompson was asked by colleague Dr. Hiro Kawamura of the University of Findlay to serve because of his extensive research and expertise regarding tourism ethnography in Japan. Thompson also serves as the external evaluator for Kawamura’s Japan Foundation sponsored project that provides professional training in ethnographic research in Japan to faculty and administrators in the College of Social Sciences and Humanities at Vietnam National University, Ho Chi Minh City – many of whom are shown in the photo above. This AAS panel resulted in Thompson’s invitation to the Annual Meetings of the American Anthropological Association in November 2019, to be held in Vancouver, BC, Canada, to present his current research on Disaster Tourism at his field site in the coastal town of Tarō in Iwate, Japan, continuing to recover from the tsunami that devastated the region in 2011.